This article first appeared in The Edge Financial Daily, on October 2, 2018. 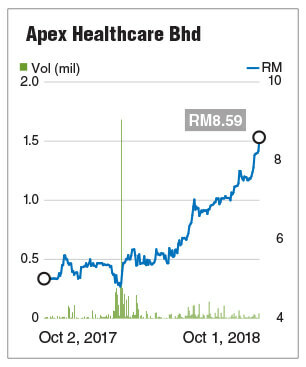 KUALA LUMPUR: Little traded Apex Healthcare Bhd’s share price hit a fresh record high again. It climbed to an all-time high of RM8.72 yesterday before closing at RM8.59, which is also a record-high closing. Year to date, it has soared 56.4% or RM2.80, making it the best-performing pharmaceutical stock on Bursa Malaysia. And it is currently the only pharmaceutical company that has a market capitalisation mark of more than RM1 billion. Apex Healthcare’s share price indeed appreciated 80.9% last year. The gain on Apex Healthcare has lifted Bursa’s healthcare index, which resulted from the recent revamp of classification for listed companies. The index went up 14.81 points or 1.11% to close at 1,349.39 points yesterday, outperforming the marginal 0.04% gain in the benchmark FBM KLCI index. The steady climb in share price sparks speculation about what could possibly be brewing in the pharmaceutical firm? Will it be heading the same path as its peer Hovid Bhd? For the financial year ended Dec, 31, 2017, the group turned in its highest revenue and pre-tax profit of RM620.26 million and RM56.05 million respectively. At the current share price, the company is trading at a price-earnings ratio (PER) of 21.8 times based on earnings per share of 37.95 sen for the financial year ended Dec 31, 2017 (FY17), a slight premium to its peers, except for Hovid which has received a second takeover bid from its two controlling shareholders — Fajar Astoria Sdn Bhd and David Ho Sue San — last month. Hovid is trading at a comparatively higher PER of 33.49 times. Interestingly, Apex Healthcare’s two largest shareholders collectively control some 70.71%, or 83.03 million shares. According to the group’s 2017 annual report, Apex Pharmacy Holdings Sdn Bhd and Australian Stock Exchange-listed investment house Washington H Soul Pattinson & Co Ltd hold 40.61% and 30.27% direct stakes respectively. However, a local fund manager shared, on condition of anonymity, that a privatisation bid is unlikely at this point in time for Apex Healthcare, as the group is currently expanding into e-commerce, which requires more capital to invest. “Sector consolidation, meanwhile, is a definite trend in the Malaysian healthcare sector. Apex Healthcare can easily be a takeover target, especially since it has ventured into what is known as the ‘future’ trend of the healthcare industry,” the fund manager added. Apex Healthcare may have more specifically triggered investors’ interest due to a number of other factors, said a corporate adviser. “There are favourable forces combined that may have triggered investors’ interest [such as], for example, the doubling in its solid oral production capacity (SPP Novo plant in Melaka) in early 2019, and it being a net beneficiary of a stronger US dollar. “Apex Healthcare is now the largest public listed pharmaceutical producer in the country. Its robust growth prospects and inherently lower risk premium through its diverse base of customers suggest its premium is well deserved,” the banker added. Apex Healthcare manufactures and distributes pharmaceutical products, such as over-the-counter consumer healthcare products, diagnostics and surgical supplies to hospitals, clinics, independent and chain pharmacies, as well as supermarkets and health stores. Besides Malaysia, the group has direct operations in Singapore, Vietnam and Myanmar. Generally, the pharmaceutical sub-industry is poised to benefit from potential changes in the healthcare sector, such as the proposed roll-out of the Peduli Sihat health scheme nationwide, liberalisation of the health ministry’s pharmaceutical procurements, and revisions of consultation fees for stand-alone private clinics, according to an investment banker. * An earlier version of the table had erroneously stated Chemical Company of Malaysia Bhd (CCM) instead of CCM Duopharma Biotech Bhd. CCM and CCM Duopharma are separate entities following the demerger in 2017. The error is regretted.